Alan Turing was born at Paddington, London. His father, Julius Mathison Turing, was a British member of the Indian Civil Service and he was often abroad. Alan's mother, Ethel Sara Stoney, was the daughter of the chief engineer of the Madras railways and Alan's parents had met and married in India. When Alan was about one year old his mother rejoined her husband in India, leaving Alan in England with friends of the family. Alan was sent to school but did not seem to be obtaining any benefit so he was removed from the school after a few months. Next he was sent to Hazlehurst Preparatory School where he seemed to be an 'average to good' pupil in most subjects but was greatly taken up with following his own ideas. He became interested in chess while at this school and he also joined the debating society. He completed his Common Entrance Examination in 1926 and then went to Sherborne School. Now 1926 was the year of the general strike and when the strike was in progress Turing cycled 60 miles to the school from his home, not too demanding a task for Turing who later was to become a fine athlete of almost Olympic standard. He found it very difficult to fit into what was expected at this public school, yet his mother had been so determined that he should have a public school education. Many of the most original thinkers have found conventional schooling an almost incomprehensible process and this seems to have been the case for Turing. His genius drove him in his own directions rather than those required by his teachers. If he is to stay at Public School, he must aim at becoming educated. If he is to be solely a Scientific Specialist, he is wasting his time at a Public School. It is not difficult to explain these things away - but, I wonder! Despite the difficult school years, Turing entered King's College, Cambridge, in 1931 to study mathematics. This was not achieved without difficulty. Turing sat the scholarship examinations in 1929 and won an exhibition, but not a scholarship. Not satisfied with this performance, he took the examinations again in the following year, this time winning a scholarship. In many ways Cambridge was a much easier place for unconventional people like Turing than school had been. He was now much more able to explore his own ideas and he read Russell's Introduction to mathematical philosophy in 1933. At about the same time he read von Neumann's 1932 text on quantum mechanics, a subject he returned to a number of times throughout his life. A M Turing read a paper on "Mathematics and logic". He suggested that a purely logistic view of mathematics was inadequate; and that mathematical propositions possessed a variety of interpretations of which the logistic was merely one. Of course 1933 was also the year of Hitler's rise in Germany and of an anti-war movement in Britain. Turing joined the anti-war movement but he did not drift towards Marxism, nor pacifism, as happened to many. Turing graduated in 1934 then, in the spring of 1935, he attended Max Newman's advanced course on the foundations of mathematics. This course studied Gödel's incompleteness results and Hilbert's question on decidability. In one sense 'decidability' was a simple question, namely given a mathematical proposition could one find an algorithm which would decide if the proposition was true of false. For many propositions it was easy to find such an algorithm. The real difficulty arose in proving that for certain propositions no such algorithm existed. When given an algorithm to solve a problem it was clear that it was indeed an algorithm, yet there was no definition of an algorithm which was rigorous enough to allow one to prove that none existed. Turing began to work on these ideas. Turing was elected a fellow of King's College, Cambridge, in 1935 for a dissertation On the Gaussian error function which proved fundamental results on probability theory, namely the central limit theorem. Although the central limit theorem had recently been discovered, Turing was not aware of this and discovered it independently. In 1936 Turing was a Smith's Prizeman. Turing's achievements at Cambridge had been on account of his work in probability theory. However, he had been working on the decidability questions since attending Newman's course. In 1936 he published On Computable Numbers, with an application to the Entscheidungsproblem. It is in this paper that Turing introduced an abstract machine, now called a "Turing machine", which moved from one state to another using a precise finite set of rules (given by a finite table) and depending on a single symbol it read from a tape. Some of the symbols written down will form the sequences of figures which is the decimal of the real number which is being computed. The others are just rough notes to "assist the memory". It will only be these rough notes which will be liable to erasure. He defined a computable number as real number whose decimal expansion could be produced by a Turing machine starting with a blank tape. He showed that π was computable, but since only countably many real numbers are computable, most real numbers are not computable. He then described a number which is not computable and remarks that this seems to be a paradox since he appears to have described in finite terms, a number which cannot be described in finite terms. However, Turing understood the source of the apparent paradox. It is impossible to decide (using another Turing machine) whether a Turing machine with a given table of instructions will output an infinite sequence of numbers. Although this paper contains ideas which have proved of fundamental importance to mathematics and to computer science ever since it appeared, publishing it in the Proceedings of the London Mathematical Society did not prove easy. The reason was that Alonzo Church published An unsolvable problem in elementary number theory in the American Journal of Mathematics in 1936 which also proves that there is no decision procedure for arithmetic. Turing's approach is very different from that of Church but Newman had to argue the case for publication of Turing's paper before the London Mathematical Society would publish it. Turing's revised paper contains a reference to Church's results and the paper, first completed in April 1936, was revised in this way in August 1936 and it appeared in print in 1937. This paper is full of interesting suggestions and ideas. ... [It] throws much light on Turing's views on the place of intuition in mathematical proof. Before this paper appeared, Turing published two other papers on rather more conventional mathematical topics. One of these papers discussed methods of approximating Lie groups by finite groups. The other paper proves results on extensions of groups, which were first proved by Reinhold Baer, giving a simpler and more unified approach. ... which can be made to do the work of any special-purpose machine, that is to say to carry out any piece of computing, if a tape bearing suitable "instructions" is inserted into it. Although to Turing a "computer" was a person who carried out a computation, we must see in his description of a universal Turing machine what we today think of as a computer with the tape as the program. While at Princeton Turing had played with the idea of constructing a computer. Once back at Cambridge in 1938 he starting to build an analogue mechanical device to investigate the Riemann hypothesis, which many consider today the biggest unsolved problem in mathematics. However, his work would soon take on a new aspect for he was contacted, soon after his return, by the Government Code and Cypher School who asked him to help them in their work on breaking the German Enigma codes. ... perhaps the happiest of his life, with full scope for his inventiveness, a mild routine to shape the day, and a congenial set of fellow-workers. Together with another mathematician W G Welchman, Turing developed the Bombe, a machine based on earlier work by Polish mathematicians, which from late 1940 was decoding all messages sent by the Enigma machines of the Luftwaffe. The Enigma machines of the German navy were much harder to break but this was the type of challenge which Turing enjoyed. By the middle of 1941 Turing's statistical approach, together with captured information, had led to the German navy signals being decoded at Bletchley. From November 1942 until March 1943 Turing was in the United States liaising over decoding issues and also on a speech secrecy system. Changes in the way the Germans encoded their messages had meant that Bletchley lost the ability to decode the messages. Turing was not directly involved with the successful breaking of these more complex codes, but his ideas proved of the greatest importance in this work. Turing was awarded the O.B.E. in 1945 for his vital contribution to the war effort. At the end of the war Turing was invited by the National Physical Laboratory in London to design a computer. His report proposing the Automatic Computing Engine (ACE) was submitted in March 1946. Turing's design was at that point an original detailed design and prospectus for a computer in the modern sense. The size of storage he planned for the ACE was regarded by most who considered the report as hopelessly over-ambitious and there were delays in the project being approved. Turing returned to Cambridge for the academic year 1947-48 where his interests ranged over many topics far removed from computers or mathematics; in particular he studied neurology and physiology. He did not forget about computers during this period, however, and he wrote code for programming computers. He had interests outside the academic world too, having taken up athletics seriously after the end of the war. He was a member of Walton Athletic Club winning their 3 mile and 10 mile championship in record time. He ran in the A.A.A. Marathon in 1947 and was placed fifth. ... work was beginning on the construction of a computing machine by F C Williams and T Kilburn. The expectation was that Turing would lead the mathematical side of the work, and for a few years he continued to work, first on the design of the subroutines out of which the larger programs for such a machine are built, and then, as this kind of work became standardised, on more general problems of numerical analysis. ... he became involved in discussions on the contrasts and similarities between machines and brains. Turing's view, expressed with great force and wit, was that it was for those who saw an unbridgeable gap between the two to say just where the difference lay. Turing did not forget about questions of decidability which had been the starting point for his brilliant mathematical publications. One of the main problems in the theory of group presentations was the question: given any word in a finitely presented groups is there an algorithm to decide if the word is equal to the identity. Post had proved that for semigroups no such algorithm exist. Turing thought at first that he had proved the same result for groups but, just before giving a seminar on his proof, he discovered an error. He was able to rescue from his faulty proof the fact that there was a cancellative semigroup with insoluble word problem and he published this result in 1950. Boone used the ideas from this paper by Turing to prove the existence of a group with insoluble word problem in 1957. Turing was elected a Fellow of the Royal Society of London in 1951, mainly for his work on Turing machines in 1936. By 1951 he was working on the application of mathematical theory to biological forms. In 1952 he published the first part of his theoretical study of morphogenesis, the development of pattern and form in living organisms. 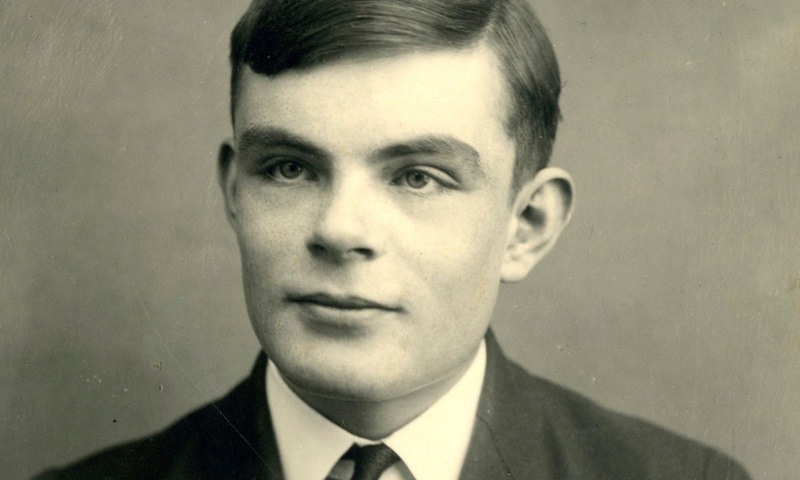 Turing was arrested for violation of British homosexuality statutes in 1952 when he reported to the police details of a homosexual affair. He had gone to the police because he had been threatened with blackmail. He was tried as a homosexual on 31 March 1952, offering no defence other than that he saw nothing wrong in his actions. Found guilty he was given the alternatives of prison or oestrogen injections for a year. He accepted the latter and returned to a wide range of academic pursuits. Not only did he press forward with further study of morphogenesis, but he also worked on new ideas in quantum theory, on the representation of elementary particles by spinors, and on relativity theory. Although he was completely open about his sexuality, he had a further unhappiness which he was forbidden to talk about due to the Official Secrets Act. The decoding operation at Bletchley Park became the basis for the new decoding and intelligence work at GCHQ. With the cold war this became an important operation and Turing continued to work for GCHQ, although his Manchester colleagues were totally unaware of this. After his conviction, his security clearance was withdrawn. Worse than that, security officers were now extremely worried that someone with complete knowledge of the work going on at GCHQ was now labelled a security risk. He had many foreign colleagues, as any academic would, but the police began to investigate his foreign visitors. A holiday which Turing took in Greece in 1953 caused consternation among the security officers. Turing died of potassium cyanide poisoning while conducting electrolysis experiments. The cyanide was found on a half eaten apple beside him. An inquest concluded that it was self-administered but his mother always maintained that it was an accident.